A graphic crash test dummy video shared by NSW Road Safety on Facebook is making people want to buckle up. 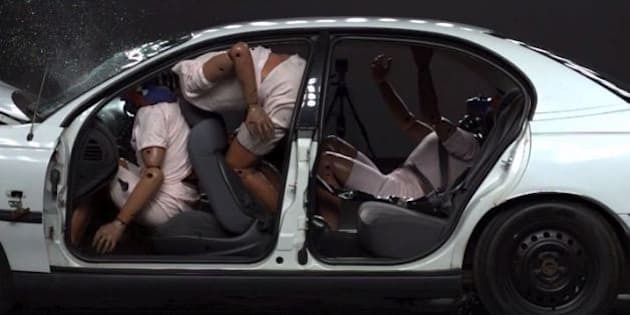 The video which has been shared more than 660 times in two days, shows the moment of impact with two dummies wearing seat belts and two without. Needless to say, those sans seat belts don't fare so well. This is why it's the law to wear a seatbelt. Clip every trip. The video is accompanied with the message: "This is why it's the law to wear a seatbelt. Clip every trip." and has been shared around the world including by Vanuatu Police Force, Rescue Team Mexico and local area police commands across Australia. The page, run by Transport for NSW, regularly shares videos about vehicle safety. If you were driving this red car which is travelling at only 60km/h, you would be lucky to survive or come out without a serious injury. If you were driving the silver car, you’d come out relatively unscathed. Why? The silver car has a five star used car safety rating and the red car has only two, however, both these used cars cost around $10k.So always check a vehicle’s star safety rating - you can buy a cheap yet safe car.